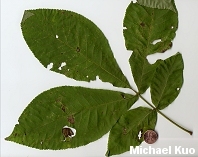 Bark grayish, breaking up into long plates that pull away from the tree; leaves compound, with 5 leaflets; nut shells very thick; growing east of the Great Plains. Habitat: Varied; in the north typically on high ground with oaks, but also in river bottoms; in the south typically in river bottoms and deltas; growing east of the Great Plains. 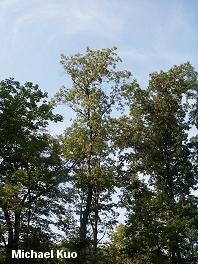 Stature: 60-80 feet high; to 2 feet in diameter; with an open crown; branches large. Leaves: Compound; composed of 5 leaflets (occasionally 7), with 3 large (5-7 inches) leaflets at the end and 2 smaller ones below; leaflets candle-flame-shaped but often wider above the middle, finely toothed; dark green and smooth on top, yellow green below. 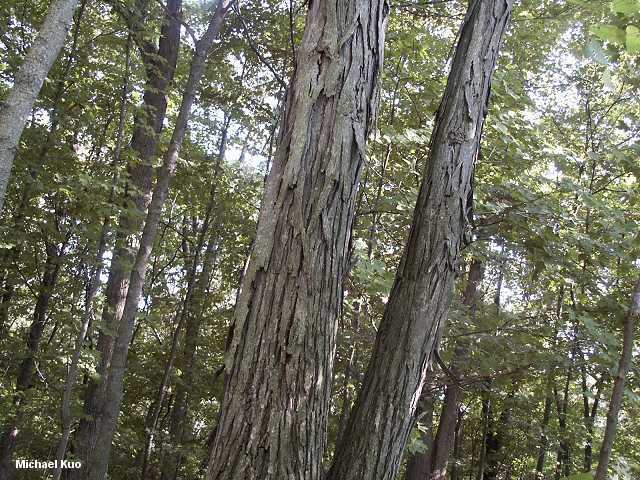 Bark: Gray; conspicuously breaking up into long, loose plates that pull away from the tree. 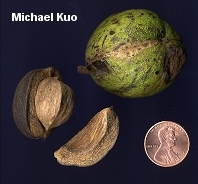 Nuts: 1-2.5 inches long; nut shell quite thick (1/4 to 1/2 inches); nut 4-sided, sweet. Amanita species; Auricularia auricula; Cantharellus appalachiensis; Cortinarius distans; Lactarius zonarius; Russula uncialis; and others.